Forget zombies and vampires this Halloween, these so-called living dead are walking contradictions. The musical styling of “Ghost Quartet” playing at the Bushwick Starr celebrates the true soul formerly known as All Hallows’ Eve — the ghost. Low-lit candelabras set a warm and romantic mood as the twinkling lights cast shadows on the actor’s haunting tunes. 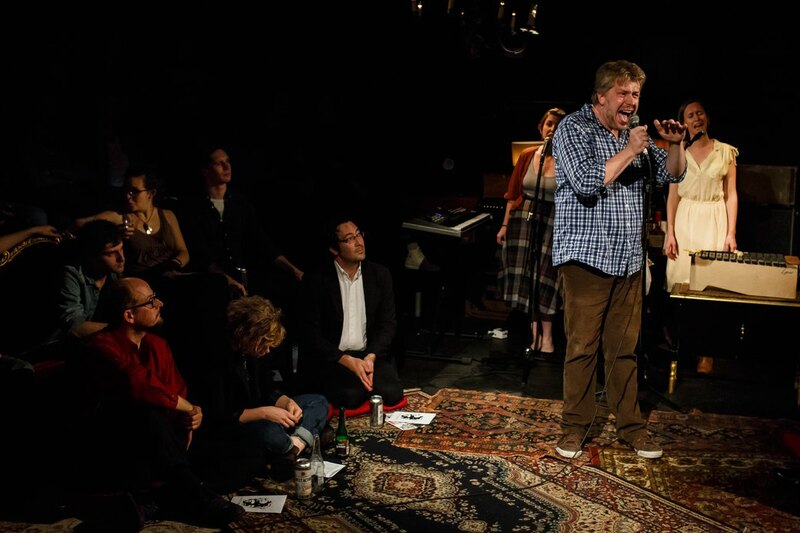 In a cabaret-style stage with plush red velvet love-seats and Persian rugs, performers—Brent Arnold, Brittain Ashford, Gelsey Bell and Dave Malloy—played a full-band of instruments and through ghostly charm, sang for an hour and a half about the trials and tribulations of the everyday, and extraordinary, ghosts that haunt us all. Songs swayed between genres, pairing jam-band with jazz and country blues with classical to create an all-embracing folk charm. Track after track, the show undulated between alternative angst and heartfelt ballads that stung the emotions with melodic harmonies and sentimental lyrics. The narrative is a combination of Bertoldt Brecht’s Epic Theater and Jean Paul Sartre’s Existentialism—an absurd rendition of the human psyche. To boil down the complex plot into an abstract narrative, the play unfolds a story of love and loss. After sisters Rose and Pearl fall in love with the same man, selfish acts spurned by anger and resentment build to form the pieces of this medieval puzzle. An act of alchemical revenge ensues as Rose collects “one pot of honey, one piece of stardust, one secret baptism, and a photo of a ghost” to cast a spell on the deceitful players. Scenes transcend time and songs intersperse inspiration from reality with fantasy. The playbill cites sources of inspiration like Arabian Nights, Edgar Allen Poe’s The House of Usher, and Ziggy Stardust to shed light on the quartet’s tales. Inspired by R. Umar Abbasi’s front-page New York Post photo of a man killed moments later by a subway train, a 21st century Rose likewise captures a photo of a ghost. Much like ghosts, the players break right through theater’s fourth wall: through audience participation. During a few songs, most notably the flawless closer “The Wind & Rain,” actors hand out instruments for the audience to play along. Random guests reach to grab small autoharps and other strange-looking musical relics to join in on the bacchanalian delight. Speaking of bacchanalian: One “track,” as the performance itself refers to its melodic scenes, “Four Friends” has performers passing around a bottle of whisky for all to swig and enjoy while the songstresses sing an ode to that one binding element of all raucous friendships—alcohol. As the audience sipped and nodded along to smooth soundings cheering on the bourbon community, a special unifying bond is formed amongst strangers and friends. 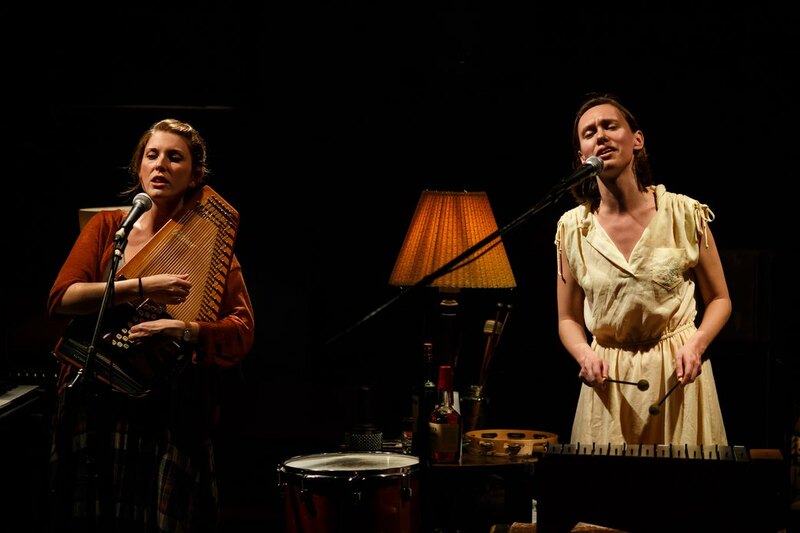 With its soulful pairing of musical genres, heartfelt and humorous lyrics, and a plot at times satirical or filled with a romantic sadness, “Ghost Quartet” is enjoyable and confrontational all at once. Lyrics spoke to the mind and the emotions through its combination of historical reference and artful poetry. 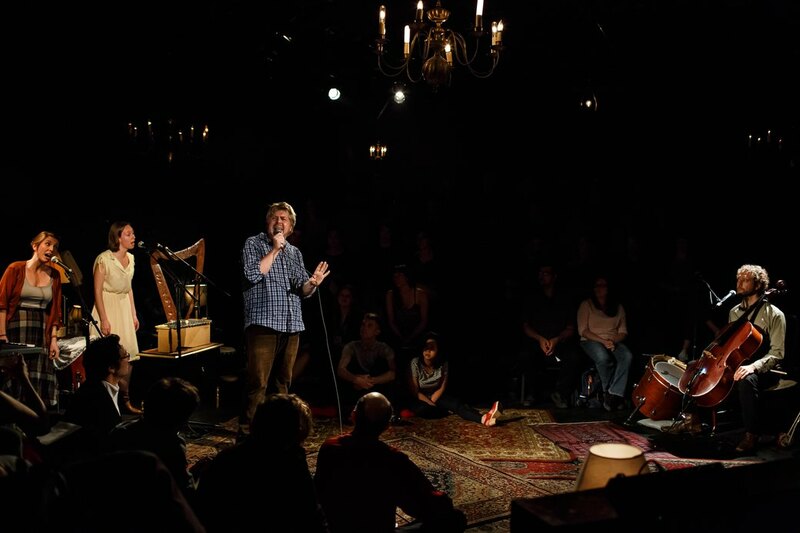 The show ends on a strange, affecting note, as the performers hand off instruments to various audience members and, one after another, gradually, each leaves sight. In the end, with all the actors gone, the music remains, a ghost of its former self, but somehow still going, note by note, beat by beat, as the chosen theatergoers continue to go through the motions, still reading the script silently handed to them by the departing musicians. Leaving the production, one longs to belong again, if only for a few fleeting moments. Whether dead or alive, in reality or in our minds, we all have ghosts haunting our daily lives. 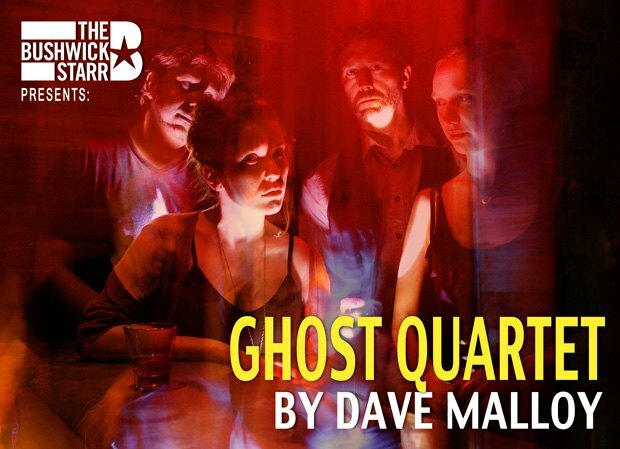 See Ghost Quartet at Bushwick Starr through November 8th. Do not miss the special post-show album release Halloween benefit party on Oct. 25th. Party tickets will be available at the box office that night, $10-$50 sliding scale.